Break the chocolate into squares (or roughly chop) to melt easily. Put the chopped chocolate and butter in a glass bowl or pot so that sits just above another pot of simmering water. Melt, stirring every so often. Pound the clove and cardamom in a mortar and pestle and add to the chocolate. Using a Microplane, grate fresh cinnamon to your liking – at least a few passes will impart wonderful flavor! A dash of cayenne (a little goes a long way) will create a wonderful Mexican-hot-chocolate-flavor. If you’re into it, a few scrapes along the Microplane with a fresh orange will seal the deal. Stir and sample to your heart’s content, trying not to eat the whole thing. Line a dinner plate with parchment, and pour the chocolate mixture on top. Using a spatula, spread the chocolate to your desired thickness. Sprinkle with flaked almonds and Maldon salt. Give the plate a little jiggle, or pick it up a few inches and release the plate so that it falls flat (if you dare) – this will even the chocolate and set the almonds and salt. Chill the chocolate in the fridge. When you’re ready to enjoy it, lift the chocolate off the parchment and break into long thin sections. 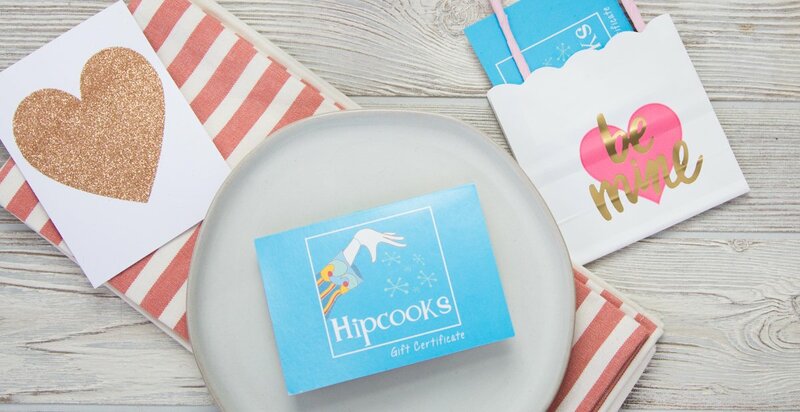 Say “Olive You” with a Hipcooks Gift Certificate!